More info:No. of participants : six - twelve Breakfast, lunchboxes and dinners are included. 820 Euro per person - Double Occupancy basis. 960 Euro per person - Single Occupancy basis. All relevant transportation is included except from/to airport. This small group Cyprus walking holiday, Olympus to Akamas, features a range of lovely short walks, taking in some of the island’s most beautiful spots, from Mount Olympus to Akamas on the north coast. A hugely varied week of walking, exploring some of the island’s diverse habitats and learning more about its cultural heritage along the way. Follow trails that wind through forests of cedar, pine and juniper. Walk past vineyards and orchards. Admire the ruggedly beautiful Akamas peninsula in the far northwest of Cyprus and walk from the Baths of Aphrodite Cave to the Blue Lagoon cove, where you can cool off with a dip in turquoise waters. 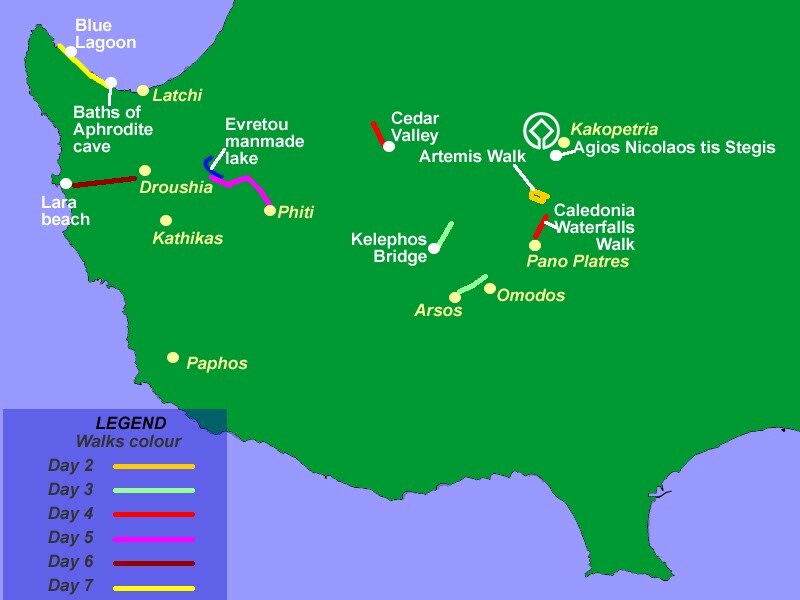 In Cedar Valley, climb Tripylos Peak, at a height of about 1,362m. You’ll also see the rich flora and fauna of the island and may even be lucky enough to spot a moufflon in Paphos Forest during the walks on day three and four. During this seven night holiday, you will visit six beautiful stone villages – Kakopetria, Arsos, Omodos, Phiti, Droushia and Kathikas – and stay in two of them (Kakopetria and Droushia). This is a wonderful opportunity to eat out in local village restaurants and discover Cyprus’ delicious cuisine, and find out more about local crafts and produce, too. Through each walk – and there are sometimes two short walks a day – you’ll discover the exceptional geology of the Troodos mountains, and see a variety of highlights, including the Caledonia (or Chantara) waterfall, a beautiful painted church (a World Heritage site), a medieval Venetian bridge at Kelephos, the Apostle Philip chapel, and the abandoned village and manmade dam at Evretou. We love to share our beautiful island with Cypriots and visitors alike. Our efforts to present Cyprus wildlife in order to educate people about it go back to 2002, with the production of a trilingual website with extensive information on the flora and fauna of Cyprus (thousands of relevant photos and info on nearly 400 bird species, 30 mammals, nearly 400 selected plant species and 50 mushroom species, as well as the reptiles of Cyprus). Furthermore a number of flora and fauna photos are shared regularly through social media (more to remind people of the richness of our island). The trip’s logistics enabled us to design a route that exposes travellers to many different habitats and places on the island of Cyprus, with quite different fauna and flora. We walk at high elevation mountain peaks, different types of forests, hills and open valleys, by waterfalls, streams, wetlands and the coast, each with its own group of animals and plants. On high elevation Olympus at nearly 2,000 m black pine and juniper rule, while at Cedar Valley the walk is in the company of the 130,000 members of the Cyprus cedar endemic subspecies and the endemic golden oak. The trip takes us also by calabrian pines and strawberry trees, storax and mastic, maple and plane, as well as a large number of oaks, vines, olives, almond and carob. Walkers have the opportunity to see various wildflowers (especially during the spring trip), including a good number of the 50 orchid species found on the island. With regards to fauna, we may be lucky to spot moufflon (a shy, local wild sheep subspecies that resides in Paphos Forest) and a number of different bird species, especially waterbirds at Evretou wetland or migratory birds on Akamas coast. We may be lucky to spot fresh water crab by a couple of streams or even trout at the stream in Caledonia Waterfalls. As a rule we walk on dirt roads and a few well marked trails that provide travellers with info in the form of signs on a number of plant species and other attractions. We offer instructions on the best and most responsible ways to view any wildlife we encounter, to avoid getting too close and disturbing the animals and to enjoy without damaging in any manner the vegetation that we encounter. We advise travellers to keep any litter and dispose it when possible to litter bins and we make every effort to have as little negative impact as possible on nature that we explore. We encourage interested travellers with spare time (especially on the day just before the start of our walking week) to pause at the Visitor Center of the Troodos National Park, the nearby Botanical Garden and the Troodos Geopark Visitor center, for in-depth information on unique Troodos. We have as a constant goal the offer to the traveller of a rich set of walks and experiences. At the same time we aim to make the use of transportation in our trip as efficient as possible because this would be in the interest of the environment in general and of our clients in particular since this is reflected in a lowering in the price of the package. We balance the use of our inhouse transportation with the right size of vehicle by local professionals (depending on each route) in all of the group’s transportation. The package doesnot include transportation from/to the airport. While we give the traveller the option to use our network of local taxi drivers, we also suggest the option of coming to their first hotel and going to the airport after the walks using public transportation. They may need to take two-three different buses but if they have time, this will provide them with the chance to visit important local attractions, like Unesco World Heritage Paphos mosaics, or Divided Walled Nicosia. Travellers are provided with supplies for picnic. We make the best effort to buy these from different local stores (instead of sourcing them from just two stores, or instead of buying lunch boxes from the hotels that we use). While, to make logistics simple, we arrange dinner in the local small hotels that we use, we also organise dinners in two family-ran restaurants in two different villages. Travellers have a couple of breaks at village coffee places. The interaction with and the financial benefit for a relatively larger number of inhabitants and service providers gives an incentive to the wider community to conserve their heritage. We use local taxis and minibuses (especially long distance) instead of professionals living in the cities because we like to support the local, rural economy. Our services are about authentic experiences, and cultural heritage is one large element of these. The trip includes a visit to one of the ten Unesco World Heritage Troodos painted churches, Agios Nicolaos tis Stegis, and to the monastery of the Holly Cross in Omodos village (according to tradition the original monastery was established at the time of the visit of St. Helen to Cyprus around 350 AD). Many of the walking routes have a cultural component (medieval bridges, watermills, the ancient chapel of St. Philip near Omodos, the Copper road, stone-built villages) that adds authenticity and uniqueness to the experience of the walker. Travellers have the chance to explore six local villages in different parts of the island (Nicosia, Limassol and Paphos district) and see local attractions and produce. They may see traditional grape presses, an olive press, a loom, ‘Phithkiotika’ vividly coloured cloth at the village of Phiti, beverages, preserves and other food produced using wheat, carob, almond, grapes and other plants like figs, bitter lemon, apple, rose, caper and more. Local cuisine is a living component of our cultural heritage, reflecting the intermixing of a number of civilisations that came to the island. In this trip we include two dinners (with many small dishes of Cyprus cuisine) in two local family-ran village restaurants in order to give travellers the opportunity to have a good introduction to the local cuisine, which we consider of a high value. Travellers will also have the chance to try Cyprus wine produced from the indigenous grape varieties, not found anywhere else (like Xynisteri and Mavro) as well as Cyprus coffee during the coffee breaks that we have in coffee places in different villages (maybe they ‘ll have the chance to converse with locals in the village coffee places). The cultural heritage component in the trip enriches travellers' experience and may benefit the local communities and help to preserve traditional products and practices.